Sometimes it's very difficult to choose between two models, which have almost similar inside and design features. For example, today we have two models - Sharp GX10 and Panasonic GD87 models, which resemble each other to a considerable extent. In reality the phones are different and we can talk about them for a long time. Let's turn to Sharp GX10 capabilities to find out its weak and strong points. This phone is available in Silver colour. You can see an external display on the front cover of the phone and a camera lens at the bottom. There is a small mirror to the left. You can use it while taking picture of yourself. It's necessary to open the phone to make shots. Near the mirror you can find a call indicator which begins to work while different events, for example while incoming calls. 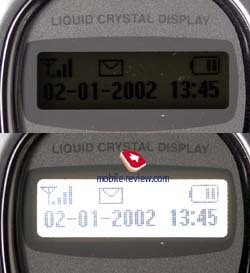 Only one text line can be displayed on the external screen, either date and time in the standby mode or a phone number in the talking mode. A service line is displayed above. It includes signal level, power status, message and some other indicators. 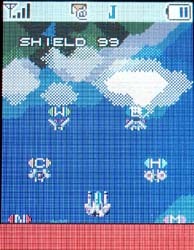 An external screen has a pastel blue (almost white) backlighting, it's rather bright. 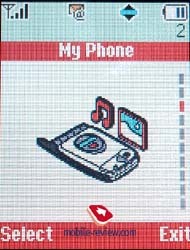 Two volume keys are placed on the left-hand side of the phone and a portable handsfree connector is positioned on the right-hand side. IR-port is located on the upper side; a system can be found on the bottom. It is covered by a rubber cap, which is fastened to the phone, what allows not to lose it. If to look at the rear part of the phone you don't find anything interesting except a loudspeaker there. Phone dimensions are 94х49х27mm. We can't say that it is a compact phone but it can be worn in a shirt pocket or a hostel. The phone weighs 110g. ; it is a little bit more than an average weight of the handset of this class. Let's open the phone. You hear a click, when you open or close the phone and fix an upper part of it. The same sound is typical to Panasonic GD87 too, though it's not a feature of all other folder phones. 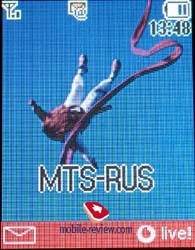 First, what you see, when open the phone, is a large internal colour screen (TFT, 65K), which has a resolution of 120х160 pixels. Screen quality is good, it has a clear picture; text information is readable. 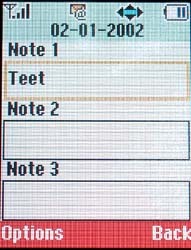 Up to 8 text line, tips to the soft keys use, a service line and a title can be displayed on this screen. 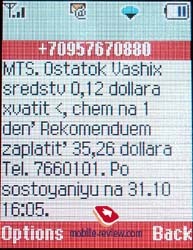 So, it's really large; almost whole SMS message can be showed on it. 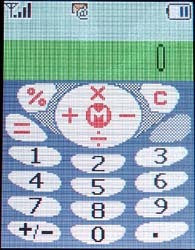 Soft keys, one 4-directional navigation with M key inside are placed under the screen. All keys are made of plastic, alphanumeric keys have a green backlighting. 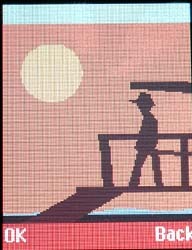 All the characters are quite visible in the dark or in the sunny day but they merge in artificial lighting conditions. In general the phone has a handy keypad, all the keys are well-spaced and respond well to commands. A handset has a lithium-ion battery of 720 mAh capacity. According to the manufacturer the phone can work up to 110 hours in the standby mode and up to 3.5 hours in the talking mode. In reality an autonomy reached 1.5 day in case of 35 minutes of talking and about 1.5 hour of using other applications (games, alarm-clock, camera). If to use extra features not so active, the phone can work about 2 days. Time of full re-charging is less than 2 hours. Left key is associated to Messages and right key - to WAP browser in the standby mode (for Vodafone, but there are no other versions yet). 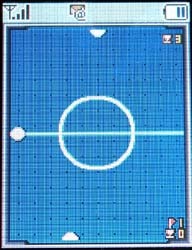 Press M button (similar to Ok button) to access a main menu. 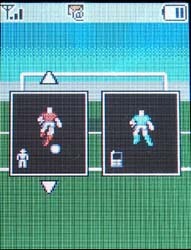 You can move through them with a help of navigation key, horizontal arrows - move through items, right arrow - enter a menu, left arrow - exit to an upper level. In the beginning it seems that such menu structure is unaccustomed, but you get used to it quickly and it turns out to be logical and convenient. A shortcut number navigation is also available. Navigation key is associated to some menu items. You can adjust loudspeaker volume if you press it to the left or enter a phonebook if you press it to the right in the standby mode. 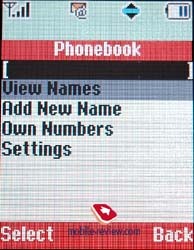 List of phone numbers in the phonebook is displayed when you press vertical arrows. Phonebook. Up to 500 phone numbers can be kept in the phonebook. Up to 3 phone numbers can be added to one name, you are free to choose an icon, a phone number type and a default phone number (it is the first one in the list). You can also add a small note and e-mail to one name. 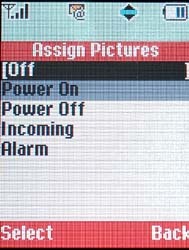 An image or a picture can be associated to each name and they will be displayed while incoming call. If you add 3 phone numbers to a contact, you reduce total number of phone numbers to 497. Quantity of other extra information is limited by free memory space. 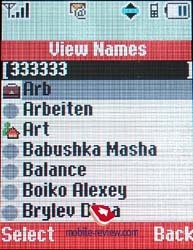 You can associate each name to a special caller group, than you can see a special icon near each name. 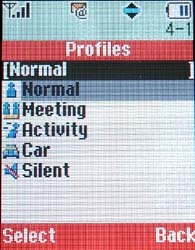 You can also set which caller groups should be displayed on the screen, sometimes this feature is useful. 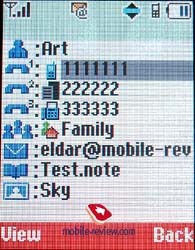 All phone numbers (from phone memory and SIM-card memory) are displayed in the total list. There is a search by the first letter. A default phone number is highlighted in a status line. It's necessary to add that menu navigation and a search are a little bit slow here because part of information is loaded from SIM-card. Messages. 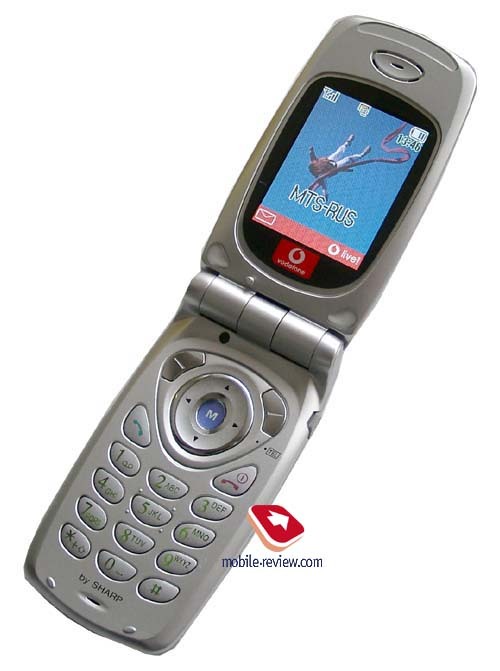 The phone supports both SMS and MMS messages. Everything is standard. Concatenated messages (up to 1024 characters) are available. There are many different settings. You can create up to 20 templates for all messages types. You can keep all outgoing messages either in Outbox or Drafts folders. Unfortunately, we didn't find how much memory space was used for keeping messages. We suppose that the phone has a dynamical memory, nothing is mentioned in a user's guide about it. 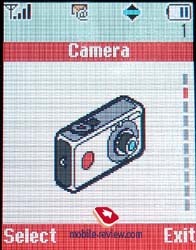 Camera. Camera submenu is next after Messages. But you enter Camera submenu, when press M button because there is no need to double access to Messages, which can be accessed quickly from the standby mode. This fact tells about good menu interface realization. If you hold M button in the standby mode, you can take pictures, the phone will be switched to a special mode. It's possible to take pictures of yourself and other people as well. A phone screen is used as a viewfinder. In spite of that zoom feature was mentioned in a user's guide, we couldn't find it in our phone. 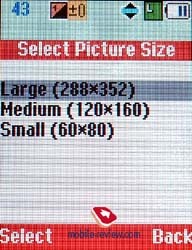 One can select three types of images resolution (288х352, 120х160, 60х80). All photos are saved in JPG format. You can also select one of 5 brightness level and one of two camera modes. 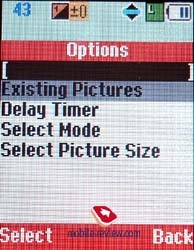 However, it's not obvious why there are two camera modes as pictures are the same in both modes. 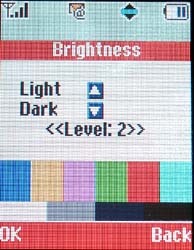 In a guide you can read that it's necessary to switch modes when there are light stains on the screen. It sounds rather vaguely. You can also set a timer and a picture will be taken with a delay. The best images can be taken from a focus distance - 30cm. Unfortunately, it's possible to transmit received images to PC or other phone only as MMS messages, not via IR-port. It's also disappointing that the phone doesn't receive images via IR-port. Viewing files in GIF, BMP, PNG, WBMP, WPNG, NEVa (animation) formats is available. Camera can be used only to take picture of friends and to associate them to phone numbers in the phonebook. All images are kept in a special folder, which can be accessed through several menus. Up to 50 images (of highest resolution) can be kept in phone memory. My Phone. 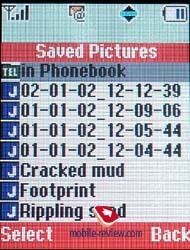 All user's files (photos, pictures, ringing tones, bookmarks and 20 templates) are stored in this menu. You can use templates everywhere no only while creating SMS and MMS messages. 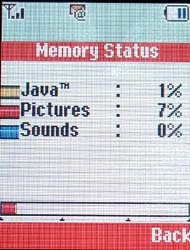 Here one can view a graphic, which shows how much memory space is left. Quantitative data are not available. 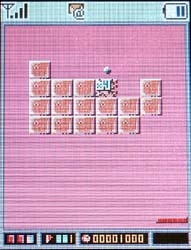 All downloadable Java-games can be found in this menu, only one game (Stormy Sight) is pre-loaded. 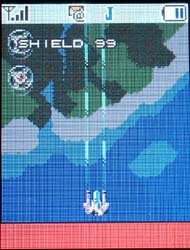 It is a kind of space arcade with nice graphics, easy control and good music. May be it is tiresome but it helps to kill the time. Fun&Games. There is again a doubled item with Java-games. You can also find a menu with 3 pre-installed games here. 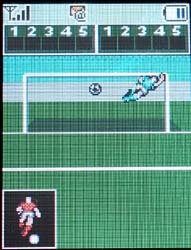 First one is PK Game, where you are a goalkeeper and try to catch a ball. Another game is Collection Hunter - a remake of Arachnoids, it's a good one. Ice Hockey is the last game, which is rather simple. Here you should return a puck. A musical composer, which is located in this menu too, is more interesting. You can select 8 or 16-tones polyphony while creating a melody. Profiles. There are 5 profiles in the phone, which you could set according to your taste. Press and hold # to change them. All sounds can be adjusted, for example, a warning tone that battery is running out, tones of turning on/off the phone, keypad tones and many others. Organiser. Several applications are hidden here, for instance a pleasant calculator and currency converter. You can also record one voice reminder (up to 10 sec.). A dictaphone doesn't work during a talk. 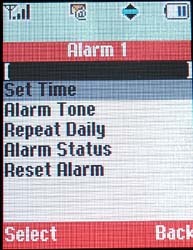 There are 5 alarm-clocks in the phone, each one can alert daily. Any sound or melody can be set as alarm-clock warning alert. Organiser itself is a bit disappointing. 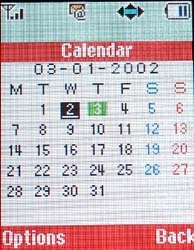 Only 3 notes (one line each) can be added to each day, though there is a monthly calendar view and go-to date function. It's also impossible to set special reminders for the notes, only alarm-clocks are available. Call Manager. There are lists of 10 received/missed and dialed phone numbers with date and time indication. Here you can view calls duration and cost. Besides you can ser a call divert here. Settings. All settings are collected here, all display settings in particular (screensavers, brightness and contrast adjusting), even external display settings. Quality connection of this phone is similar to other phones from other manufacturers. Sound is clear, sound volume is sufficient. The phone has a 16-tones polyphonic ringer, it is rather loud but not always heard in noisy places. On the contrary, vibrating alert is weak, probably, because of phone dimensions. Collection of ringing tones is rich. To say the truth not all melodies are usual, some of the acquainted classical tunes sound different (mp3, 700Kb). It's possible to use IR-port only to work with GPRS, one can also purchase a cable to do it. Phone negatives are the following: there is no possibility to send/receive images via IR-port, besides, the phone has a scarce organizer without reminders. Main virtues are a good screen quality, integrated camera, pleasant polyphonic ringer. We know that many consumers try to choose the phone between Sharp GX10 and Panasonic GD87. Let's compare them shortly and find out strong and weak points of both handsets. Sharp GX10 has a lesser price against to GD87 (222 Euro against to 299 Euro with Vodafone service contract). But GX10 has larger dimensions, it's not so elegant as GD87. A quality of internal displays is excellent in both phones. 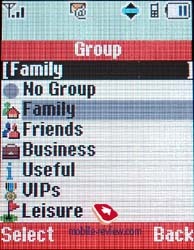 But you can choose several colours of external display backlighting in the phone from Panasonic. 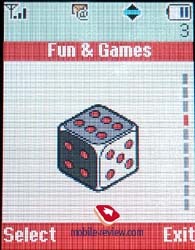 There is also a nice additional indicator in GD87, which shines when the phone is active. A great advantage of Panasonic is that it is a tri-band phone (GSM900/1800/1900) while Sharp is a dual-band phone (GSM900/1800). We think that cameras are similar in both models, there are no great differences in images quality. But you can apply many extra effects to images in GD87. Phones capabilities are the same concerning SMS and MMS messages. Sharp loses if to speak about organizer and memo function. But it has more interesting games and Java-support. A large phonebook memory is also a virtue of this phone. Autonomy of two models is comparable. Even such short competitive analyze shows that Sharp is less advanced phone than Panasonic. If your choice is not connected with your finances it's better to choose GD87. But Sharp GX10 is a good of phone especially if you have financial difficulties.